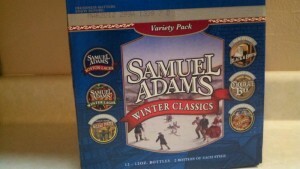 Samuel Adams has once again announced the arrival of winter with the release of this year’s Winter Classics Variety Pack. Again this year, Samuel Adams has kept the spices low to ensure drinkable, non-cloying beers. Chocolate Bock is back, and I hope it’s only a matter of time before they make it available in 6/12-packs. This year’s addition to the mix pack is the Black and Brew Coffee Stout, which replaces White Ale in the pack. I had my first experience with Samuel Adams’ coffee stout several years ago (2008) when it went up against the Blackberry Witbier in the Beer Lover’s Choice where, sadly, it lost, even though it received my vote. Have you tried the Winter Classics Variety Pack for 2011? Which ones in the pack do you like? Which ones don’t you like? Glad to see the chocolate bock! How did I miss it last year? I remember having to spend $20 something to get the Chocolate Bock in a giant wine-sized bottle. Nice bottle, mind you; still decorating a shelf somewhere. But I’m very glad to have a slightly more convenient way to get at the chocolate this time around. That seems to be the consensus of my friends, too. They really liked the Chocolate Bock but at $20 a bottle, there were other beers they would rather have for that. This is a great variety pack … but it disappears from the stores before winter starts! Why create a pack that contains so many great winter brews, when it is impossible to fing a second pack come winter? It was a good winter sampler from Sam Adams this year. I was glad that they booted the White Ale this year in favor of something a little more complex, darker, and relevant for the colder months.